Everyone wants to save money, right! So how far would you go to save money in your bathroom? Is toilet paper really necessary? How can that little piece of leftover soap be of any use? If you like challenges as I do then this is right up your alley! 1. Let go of the toilet paper. This is a huge money drainer. Instead install a toilet hand sprayer next your toilet. Use the water to clean up after using the toilet. You will also feel fresh afterward. You can use reusable cloths to wipe dry following. If you cannot get away from using toilet paper then buy it in bulk. 2. Do not throw out that little sliver of soap that is leftover. Instead, when opening a new bar stick it together. This really works! You could also save up the slivers and make a new bar of soap. I have not tried soap making before. 3. When washing hands rinse them under the tap and turn off water to lather hands. Then turn water back on to rinse soap off. 4. Buy a cheap soap dispenser and buy refills of liquid soap. Fill the dispenser with one third soap and the rest with water. Shake until the soap is well dispersed. Now you have foamy soap that will go a little further. 5. Buy yet another cheap soap dispenser. Only this time use it to fill with toothpaste. If there are kids around the home it is likely that toothpaste is being wasted when squeezed from the tube. Take the tube and squeeze the toothpaste into the clean soap dispenser. Easy dispensing and less waste thus saving money. Note: A pea sized amount of toothpaste is all that is needed when brushing as recommended by the dental association. 6. When brushing teeth fill a small cup with water to rinse toothbrush and mouth instead of using running tap water. 7. Install a low flow shower head if you don't have one already. 8. When showering turn off water when shampooing hair or shaving. 9. Do not use shampoo in your hair every day. This takes away essential oils that keep your hair healthy. When you do shampoo use only a little amount. It will be just as effective. 10. When down to your last bit of shampoo/conditioner add a little water to the bottle and shake. There is usually enough product around the insides of the container to get a few more washes. 11. Don't throw in the towel after just one use. Use at least two or three times before throwing them in the laundry. 12. Do not waste money on expensive toilet bowl cleaners. Instead pour in some baking soda followed by some vinegar and leave for about one hour. Then use a toilet brush to wipe. For really tough stains repeat and leave baking soda and vinegar overnight before wiping with brush. Those are some good tips. I already employ most of them. Thanks for stopping by my site. Am now following you. Thank you for stopping by and following back! I do the one with the soap and smooshing it to the new bar all the time when the slivers get too small. I use only a little bit of toothpaste too and it lasts a ton longer. I laughed at the towel one because my husband always says that the towel isn't dirty because he cleaned himself in the shower :) We usually use ours at least until the next laundry day and then they are swiped if there is room in the load to add them since there is no added cost. The other one that I did was cut open the lotion container and dip my hand in to get the stuff stuck on the inside. It eventually dried out before I got a chance to use it so next time putting it in a plastic bag!! Just added you to my following :) Thanks for following me! I have never tried cutting open the lotion container for the last bit. I am sure there is probably enough left behind for a a few more uses. I am going to try this one too! Wonderful ideas! I do a lot of these to be as frugal as possible, but it's such a pain to get the rest of my family to do it. They all are the worst at using a towel just once. These are all great ideas! I need to do these things more! 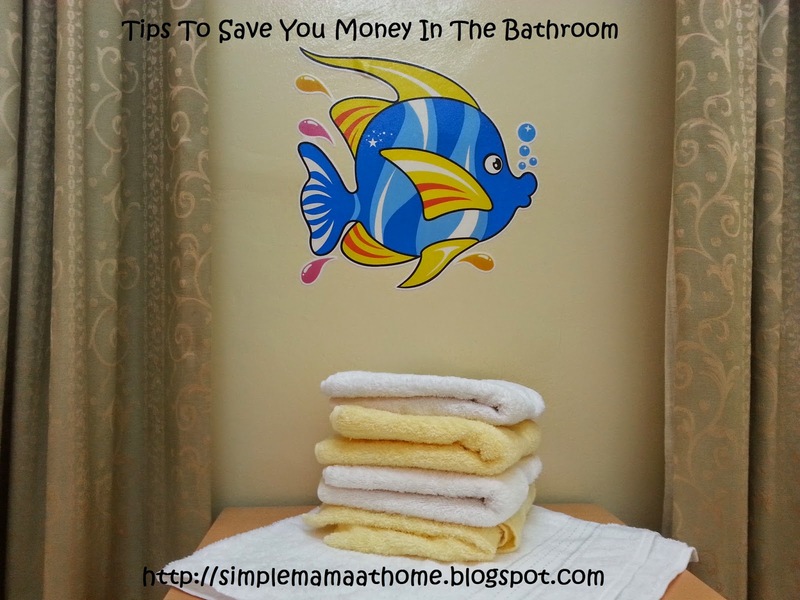 I love these ideas for saving in the bathroom. I love buying Mrs. Meyer's hand soap refills and putting them in my pretty glass dispensers. Great tips. There's a few of those I already do. I particularly love the idea of using a soap dispenser for toothpaste. My daughter goes through the stuff like crazy and makes a mad mess with it. I'll have to pick one up and see if it cuts down on the crazy. #5 is a great idea... I never thought of this!! Thanks for the tips! I'm going to try the toilet cleaner with baking soda and vinegar. I do some of the others, like sticking the soap together and adding water to use up all of the shampoo and conditioner in the bottle. I love the tip about sticking the old soap to the new soap! My grandma taught me that when I was younger! Works great! Great tips. I always buy my toilet paper in bulk. These are very good and helpful tips. I've tried some of them and others I will explore.